In an earlier blog I explained how I plant my “early” squash in late June to avoid the devastation caused by the squash vine borer. 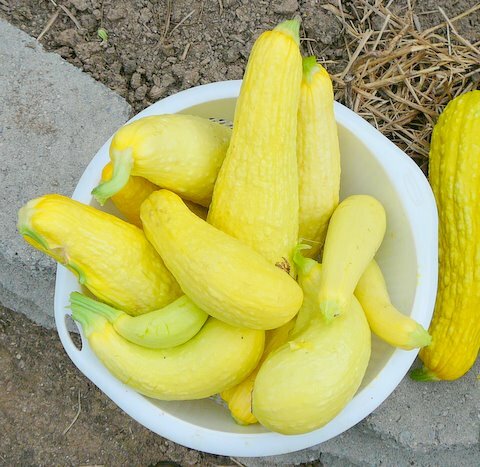 In less than six weeks after the planting, I’ve already picked several colanders of beautiful yellow summer squash, and the waist-high plants are loaded with blossoms that promise too many squashes to harvest over the next few weeks. I credit the drip-irrigation bucket, around which I planted the squash, for the plants’ vigor during this summer’s above-average heat. I hose water pretty much full blast into the bucket for about three minutes every other day. What do we do with all the squash? (1) The youngest squash we slice and add to our summer salads. It adds both color and a refreshing crunch. (2) For a warm vegetable, we sauté quarter-inch slices in olive oil, minced garlic and some sliced onion if we have some, and seasonings until the squash is “just right”—not too soft, not quite crunchy. (3) I give some to several neighbors, who probably think some tipsy squash gnome leaves the veggies on their doorsteps in pre-dawn hours. (4) And our daughter lugs still more to her office where her co-workers claim them within minutes, sometimes along with extra cucumbers and quart plastic bags of Sungold and Juliet tomatoes. Grow It Eat It Share It. Could you explain your drip irrigation bucket a little more? Is it on an earlier post? Hi, Dale. My simple system is based on 4-gallon buckets. I drill five or six 1/4″ or 3/8″ holes in the bottom and sink the bucket into the garden soil about 6″. 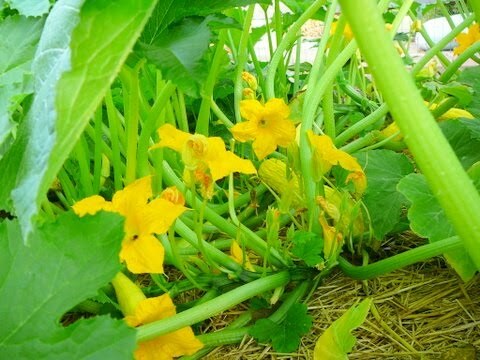 Then I plant a circle of squash around the bucket–say 7 or 8 plants after thinning–about 18″ or so from the bucket. I then mulch (newspaper covered with straw)and water via the bucket. I can hose water in full force without disturbing plants or soil. I happen to use bigger buckets because I have them, but I've also used 2-gallon black nursery containers to the same effect between two hills of cukes. I posted earlier this season about how I used buckets to drip irrigate my tomatoes. But buckets don't work everywhere, such as in my raspberry patch. I think I'll have to go to a small drip irrigation system there based on store-bought supplies.